Shaanxi province lies on the northwestern frontier of China’s “heartland”; the last stop before the Gansu corridor, which snakes northwest between the Tibetan plateau and the Gobi desert up to Xinjiang and Central Asia. 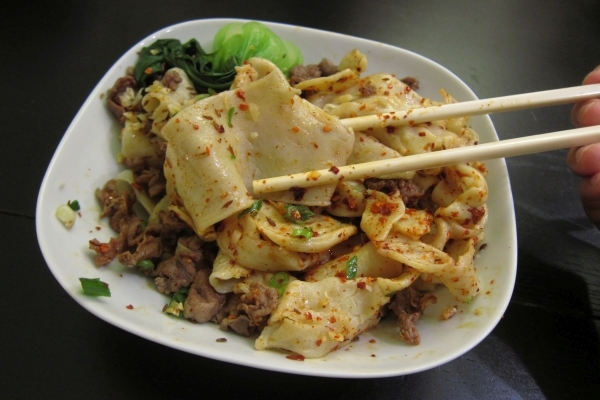 Shaanxi food has some clear Central Asian influence: lamb, beef, and cumin are commonly used, unlike the rest of China. You could think of Xi’an (the capital of Shaanxi, and in ancient times the capital of China) as the eastern end of the Silk Road. Kebabs are a common street food in Xi’an, as are fried bread sandwiches stuffed with lamb meat. 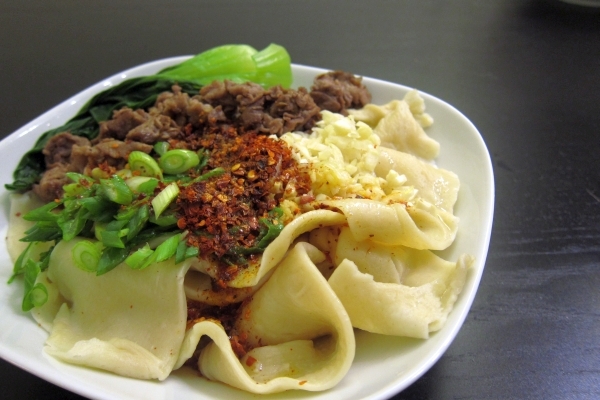 “Belt” noodles (裤带面 ku dai mian) are a Shaanxi specialty. They’re also known as “biang biang mian”, written with a special, extremely complex Chinese character that doesn’t exist in dictionaries (Wikipedia article). Just like the name, they’re wide like a belt and somewhat thick with a good chew to them. I spent the summer of ’07 in Xi’an and tried this dish in a couple restaurants. 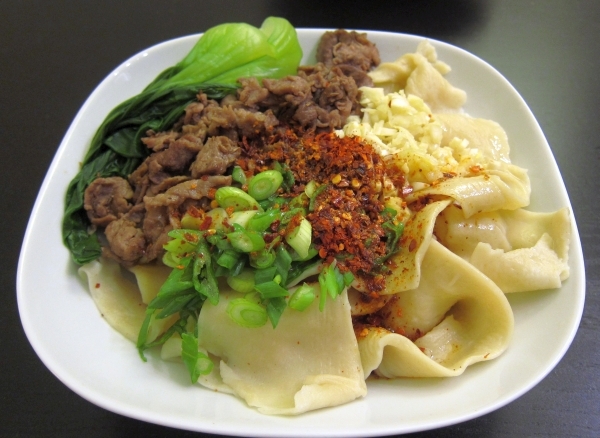 Every place selling belt noodles serves it slightly differently; the common feature is red chili powder, garlic, scallion, and vinegar. 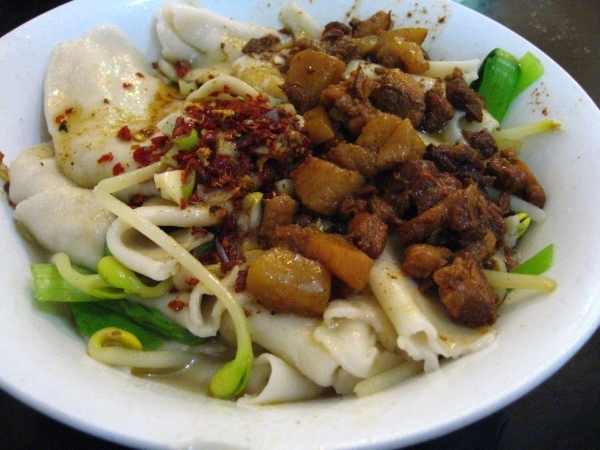 The noodles are often eaten with no meat at all, but stewed pork, lamb, and beef are common toppings. 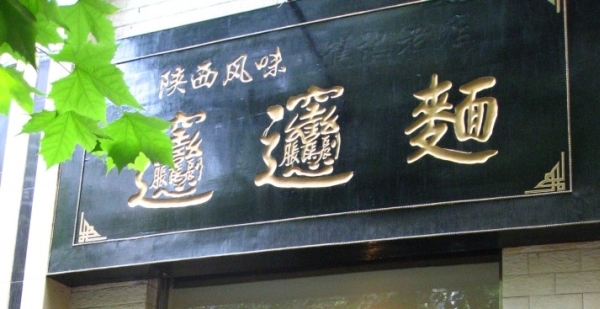 New Yorkers will be familiar with Xi’an Famous Foods, who serve a similar dish. 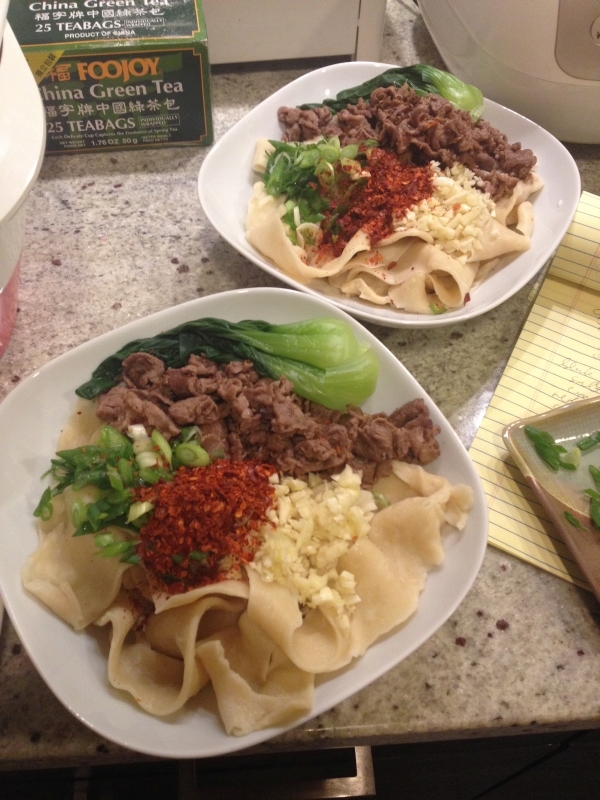 I like their food, but I find their noodles aren’t as good as in Xi’an, or homemade. Their cumin lamb noodles are absolutely drenched in oil – while it is an oily dish, their version is way too oily even for me. 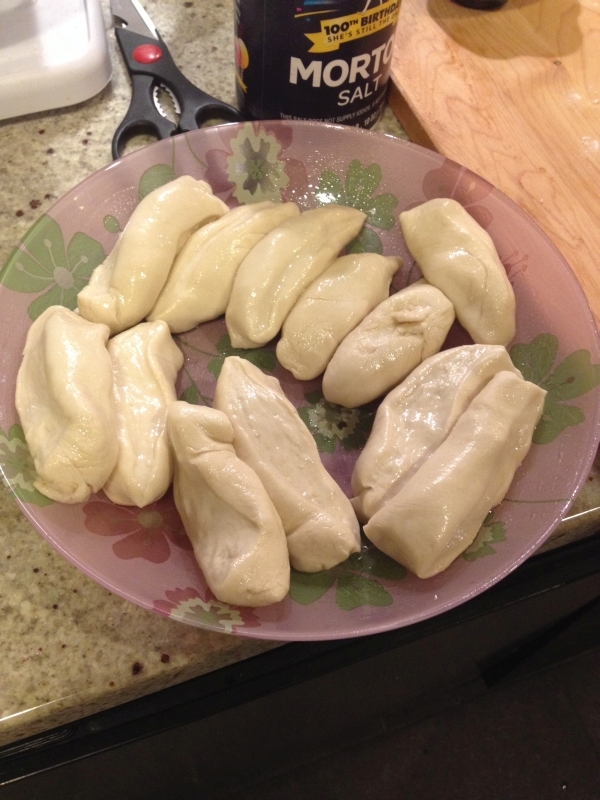 This recipe is loosely adopted from 雯婷茜子’s recipe at Meishijie (recipe in Chinese). Red chili powder – ideally the somewhat coarsely ground kind where some pieces of seed are still visible. In between powder and crushed/flake form. It’s sold in Chinese groceries. Bok choy or other leafy green vegetable (optional), boiled. Bean sprouts, green pepper, and cilantro could also be nice garnishes. 1. Make a dough out of flour, egg, salt, and water. Knead well for 10 minutes and let this rest for 1 hour. 2. 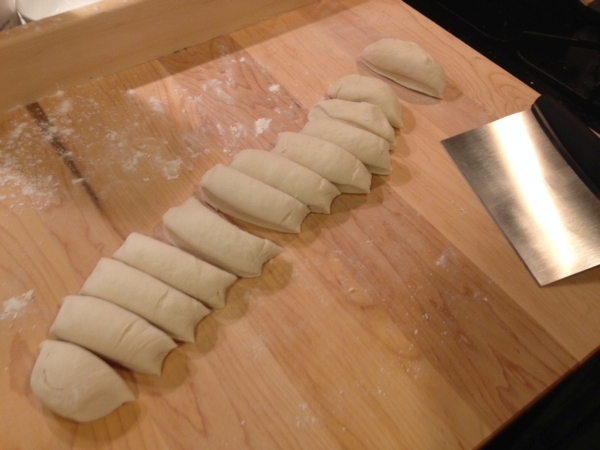 Make a thick cylinder out of the dough and cut it into smaller pieces. 3. Coat these pieces in oil and set aside. 4. 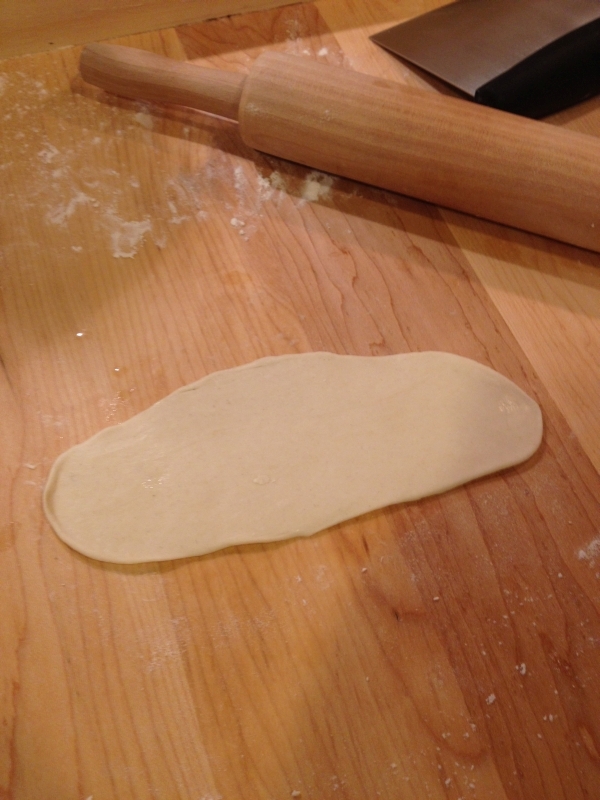 Take one of the pieces and flatten it out with a rolling pin. 5. Lift the flattened piece, holding each side, and wave it up and down, smacking with the middle of the dough while pulling gently. You should hear a “thwap! thwap! thwap!” noise. Smacking the dough helps stretch it out. 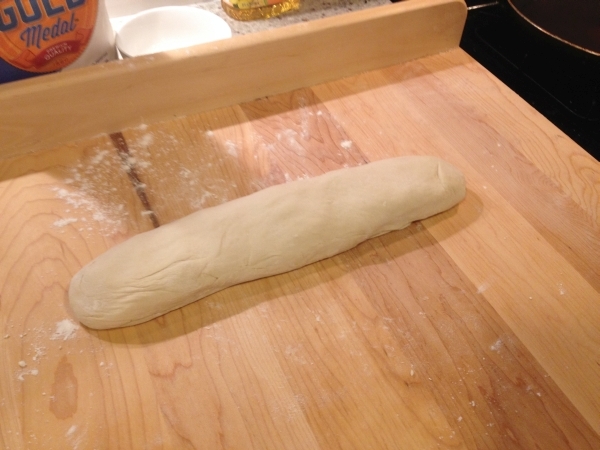 You should end up with a long piece of dough about 1-2 inches wide and very thin. 6. 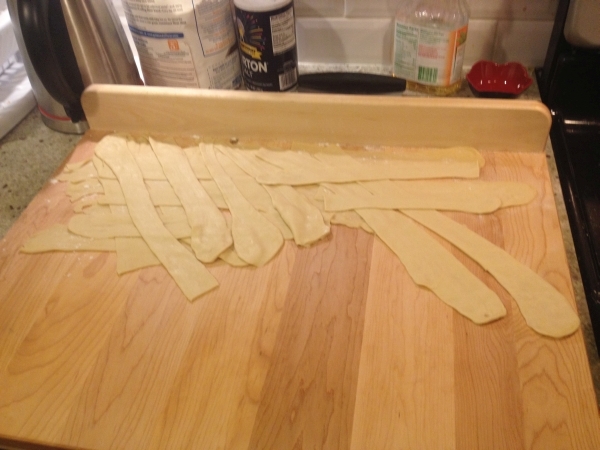 The ends you held will probably be a bit thicker than the rest of the noodle, flatten these out with your fingers or the rolling pin. 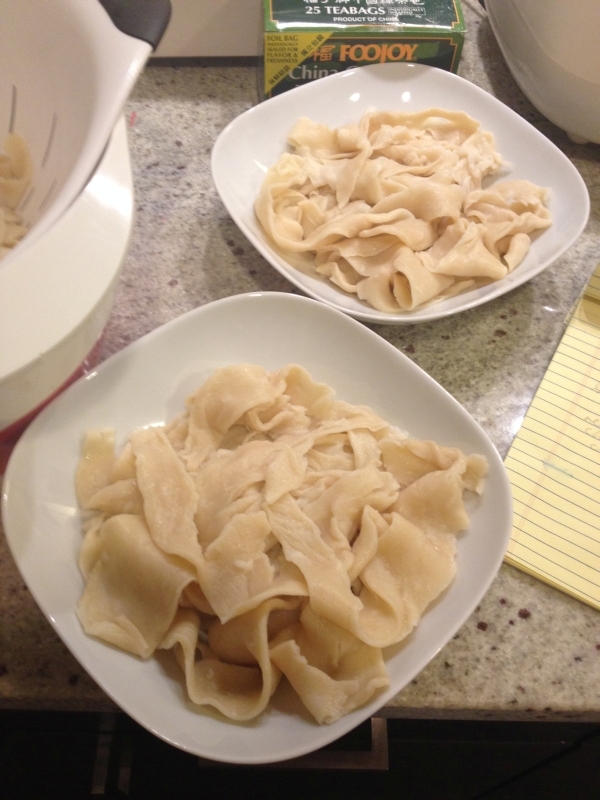 Cut the noodle in half if you like (makes serving them easier). 7. Unlike laghman noodles, these noodles (owing to their flat shape) have a real risk of sticking together even when they go in the water. Either space them out or oil them to make sure they don’t stick. 7. Cook the noodles in boiling salted water; after the water returns to a rolling boil for 1-2 minutes, the noodles will be done (taste one to make sure). 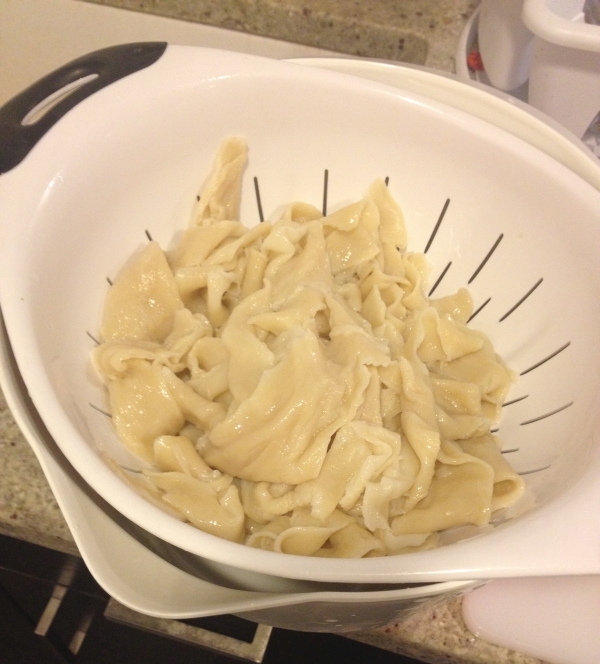 Pour the noodles into a sieve and rinse with cold water. 8. Plate the noodles. Some sticking/ripping of the noodles is inevitable. If you can make belt noodles without them sticking together or ripping, I salute you. 1. 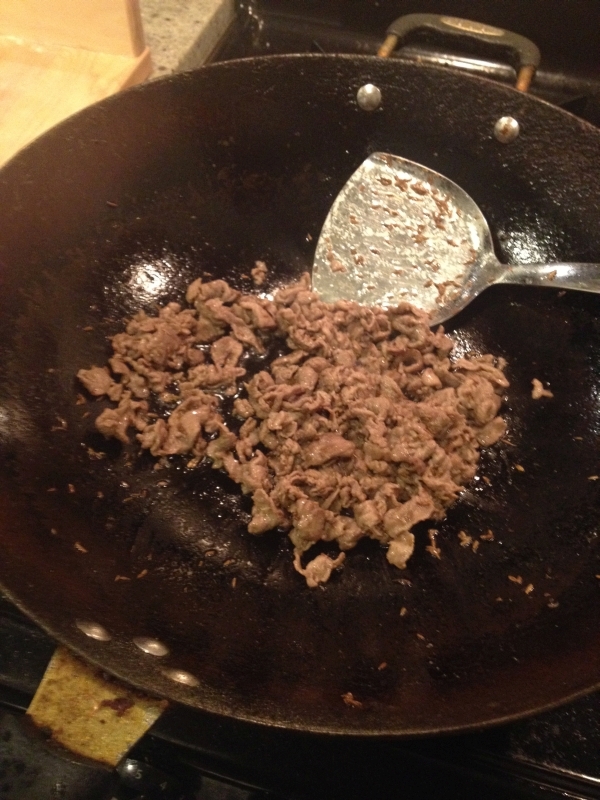 Chop up some lamb meat, fry over high heat, and add salt and cumin seeds. Put aside. 2. Finely dice the spring onion and garlic, set aside. 3. Put a dash of soy sauce and black vinegar on each noodle bowl and mix well. 4. On top of the noodles, put the diced garlic, spring onion, and a heap of crushed red pepper in mounds next to each other. 5. Heat some oil until it is very hot. Now, for the magic step: pour the scalding oil directly onto the heap of red pepper. You should hear crackling and smell an aroma as the pepper and garlic is instantly cooked. 6. Top with the lamb meat and any vegetable, if you like. 7. Mix everything well before eating. The hot oil turns the chili powder into chili oil. Enjoy! You can give your family meal surprises anytime. Isn’t it? Hi Jack, typically I just put enough water so the flour and water can be mixed into a relatively firm dough. Basically I add some water, mix, if it’s not enough for all of the flour to turn into dough, then add more water. As you are kneading the dough, if you find the whole mixture too sticky and not firm enough, then keep adding flour and kneading until it no longer sticks to your hands. The exact ratio is not super important. How exactly are your noodles not turning out the way you want them? I don’t use any ‘peng hui’ in my noodles, just flour, egg, salt, and water. 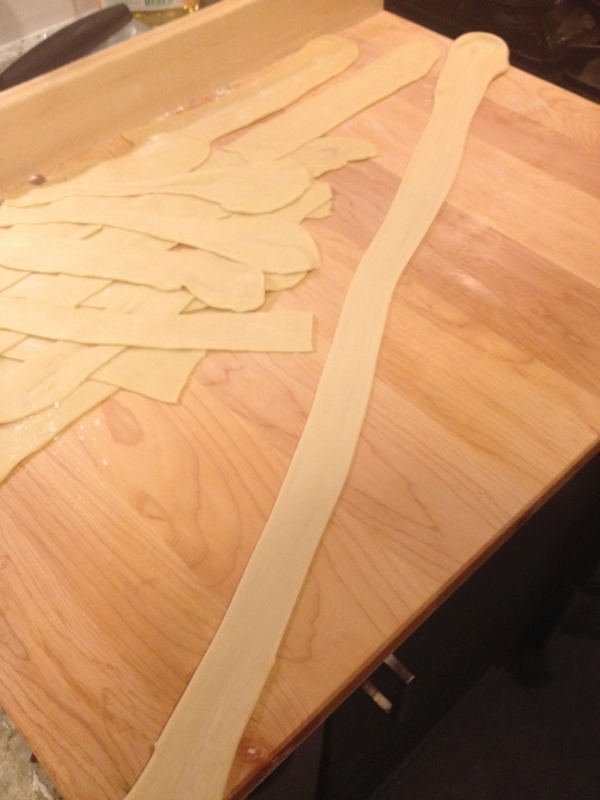 You don’t need a rolling pin, it just helps get the initial ‘flat’ shape so the noodles stretch out into a smooth, thin ‘belt’ instead of into a typical ‘cylindrical’ noodle shape. As long as you have kneaded the dough enough and rested it, it should pull out without any issues.